Stories of success and failure learning to control the one addiction in this world you cannot quit cold turkey. Who is the Calorie Junkie? I like to try new things and find new recipes all the time. So the other day I picked up Morningstar Farms Spicy Black Bean Burger. As described on the box these are a Southwestern-style veggie burger with black beans, sweet corn and tomatoes. I was thinking how I could enhance the flavor of the sandwich so it was not just a Spicy Black Bean Burger on a bun while not adding too many calories or points to the overall meal. Then it came to me: a Spicy Garden Salsa Burger. This is a simple but tasty recipe. Follow the instructions on box to thaw the patties. Then place on the grill. 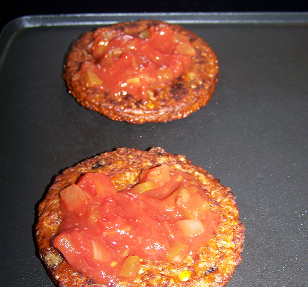 After grilling both sides for 5-7 minutes each, place a tablespoon of salsa on each of the patties. Add a tablespoon of cheese on top of the Salsa. Then you can either allow the salsa and cheese to warm and melt on the grill or take it off and microwave it for 30 seconds. I actually let it warm for just a few minutes and then put it into the microwave to melt the cheese. Stack patties one on top of the other upon your hamburger bun and enjoy. I really loved these and so did the Hubby. The patties had a really nice flavor and it was a hearty burger for the points. This is a great hearty burger. 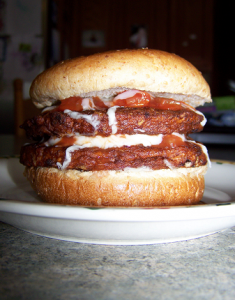 I am already thinking of some other ways I can use the Morningstar Spicy Black Bean Burger. The burger itself has a great flavor that could really add to a number of dishes. I expect that I will be posting more recipes in the future involving these. 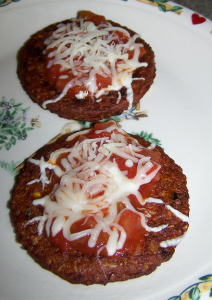 This entry was posted in Recipes, Working With Weight Watchers and tagged recipe, Weight Watchers, Weight Watchers recipe. Bookmark the permalink.